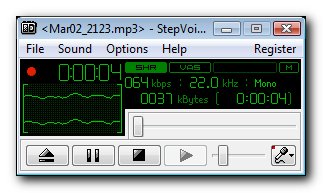 StepVoice Recorder is software for real-time recording with MP3 file format support. It allows recording from any sound source, such as a microphone, line in or any sound currently playing on your PC (Internet radio, movie sounds, etc.). A wide range of mp3 bitrate settings allows to vary sound quality from telephone (3.5 to 7.0 MB/hour) to CD (3.5 to 7.0 MB/minute). With sound levels visualization you can easily adjust volume level before recording for best results. NEW: Mixing virtual 'speakers' line with microphone (for Majicjack and Skype). Qweas is providing links to StepVoice Recorder 1.8 as a courtesy, and makes no representations regarding StepVoice Recorder or any other applications or any information related thereto. Any questions, complaints or claims regarding this application StepVoice Recorder 1.8 must be directed to the appropriate software vendor. You may click the publisher link of StepVoice Recorder on the top of this page to get more details about the vendor.